Anti-Static bags protect devices or components from electrostatic discharge, a critical safety precaution during transit or storage outside of the safe working environment. Static protection can be achieved by a bag with a conductive layer, creating a Faraday Cage enclosure. We also stock a full range of Metalized Static Shielding Bags with a lockable gripseal feature, they offer full protection against the risks of ESD. Our range is designed to give ultimate protection against static damage to electronic components and devices during handling, in storage and during transit. Anti-Static poly bags prevent build-up of electrostatic fields in an ESD protected area when storing non-ESD sensitive devices, like as screws and bolts. They do this by dissipating a static charge to ground. The grip lock seal keep items safely inside the bag until they’re required. These quality, blow-molded bags with anti-static additives are made from LDPE & LLDPE. Custom sizes and print are available upon request. 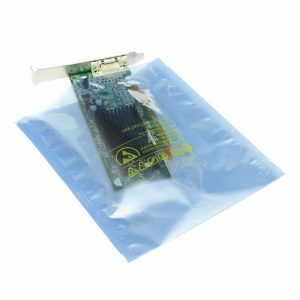 Open-top, Static Shield Bags are the perfect solution for protecting sensitive electronic products or equipment from electrostatic discharge (ESD) during storage and transit. The 4-layer construction guards against charges inside and outside the bag, and are semi-transparent for easy content identification. Used for safe storage of PCBs, integrated circuits, motherboards, computer components & more. Great range of standard sizes from stock, custom sizes and print available on request. Contact our team today to find out more, email us here. Our Pink Antistatic Bags have the ability to dissipate a static charge to ground preventing static charge building up on the package or device. The material is also antistatic and will not charge up when rubbed against other materials. These bags can be used to safely package/transport your non-ESD sensitive devices within your ESD protected area. Available in a wide range of sizes, shop the range today. Antistat’s puncture-resistant Moisture Barrier Bags, 3.6Mil – are produced spceifically to protect sensitive equipment and products from electrostatic discharge damage (ESD) and moisture damage during transit or storage. The bags conform easily to the shape of products for vacuum packing andl also providing near perfect puncture resistance. Offering very low gas and moisture permeation, the inner core of polyethylene allows for extremely reliable hermetic sealing. These bags offer maximum resistance to vapor and oxygen penetration. Available in multiple thicknesses and sizes, and specific custom manufacturing to suit your requirement, we always have a moisture barrier bag to meet your needs. Our high-quality Moisture Barrier Bags (4.4Mil) protect sensitive equipment and products from both electrostatic discharge damage (ESD) and moisture damage during shipping and storage. The puncture-resistant, opaque and light-fast 4.4mil material ensures that the contents cannot be seen, offering additional operational security. Suitable for vacuum-sealing, moisture barrier bags offer maximum resistance to vapor and oxygen. Antistat’s grip seal metalized static shielding bags are designed to give total protection against static damage to electronic components. The 4-layer construction creates a Faraday cage enclosure, shielding sensitive contents from charges from inside and out, making it ideal for static-sensitive components like PCBs. The semi-transparent material allows for easy content identification, and the grip seal ensures contents are safely stored until required. Choose from our range of in-stock sizes today.